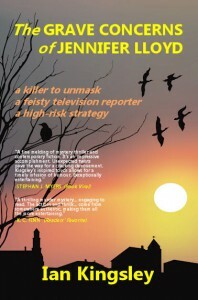 The video is just a taster of 'THE GRAVE CONCERNS OF JENNIFER LLOYD'. A feisty young television presenter is fighting to keep the job she loves. She figures exposing a murderer live on-camera is the way to do it and she's willing to take risks. But will her recently acquired self-defence skills be enough when the knives come out? Yet nothing is plain. Was there one murder or two? One murderer or two? Find out more about this novel in both paperback and eBook formats at my website. If you would like a free copy and promise to post your review here and on Amazon or Smashwords within 28 days check this offer out here!